I have had a king size triple irish chain quilt top made for a LONG time. 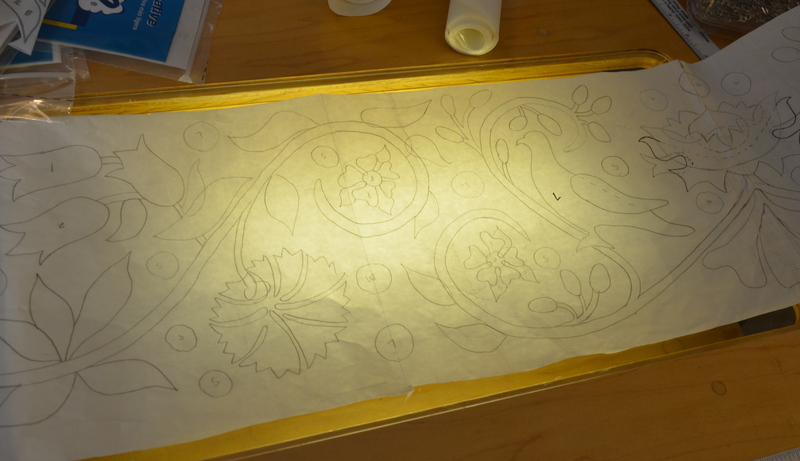 I never finished it because I wanted to design a border for it. Well I am tackling another UFO and am designing the border. Here is my method and progress to date. First, I taped a LOT of freezer paper together making a strip 95 inches long which matches the four sides of my quilt top. The border is 9 inches wide. 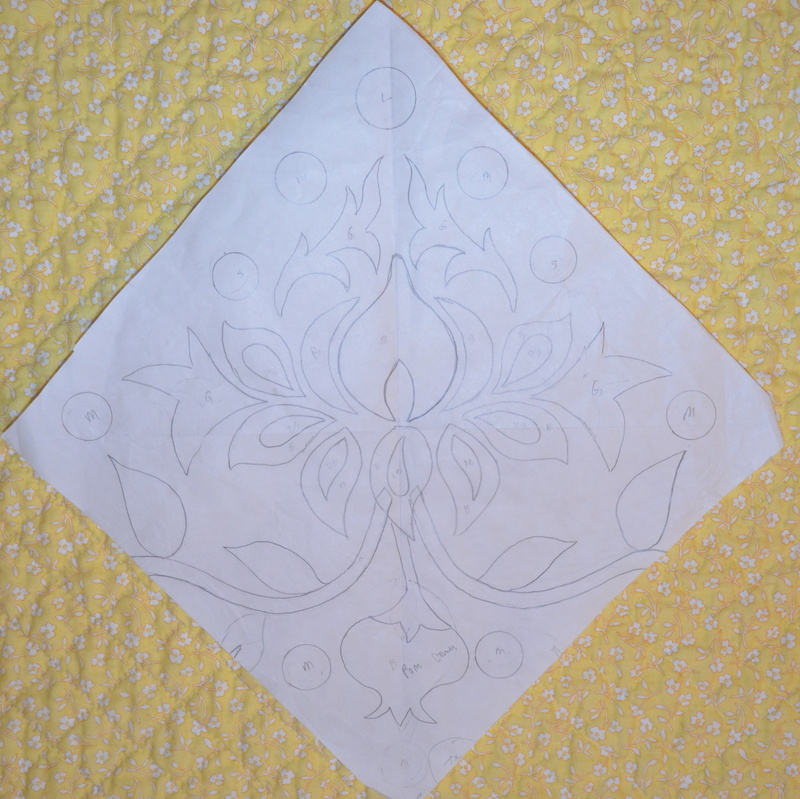 I drew a design on one half of my freezer paper. Then I traced it in reverse on the other half. I now have one entire border to work with. 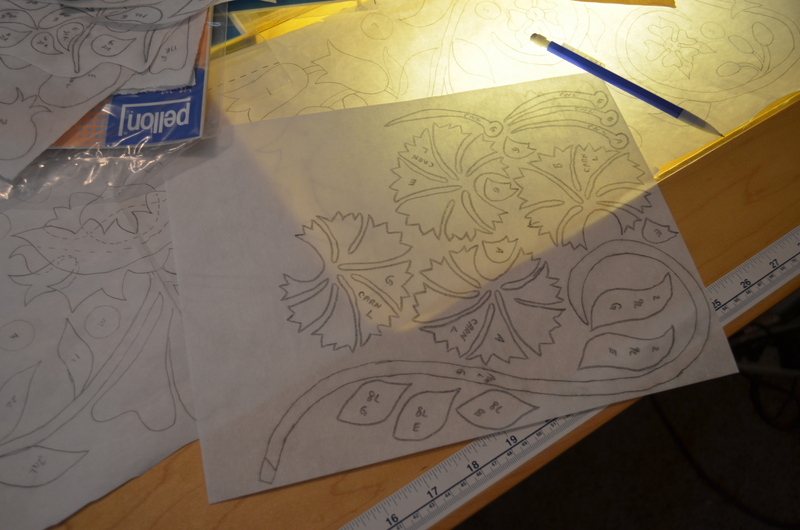 Some of the flowers I used from the William Morris Applique book and some I drew. I drew all of the vines myself. It was drawn with a mechanical lead pencil allowing for LOTS of mistakes. Here are some photos. [Nothing like a million little pieces, huh?] 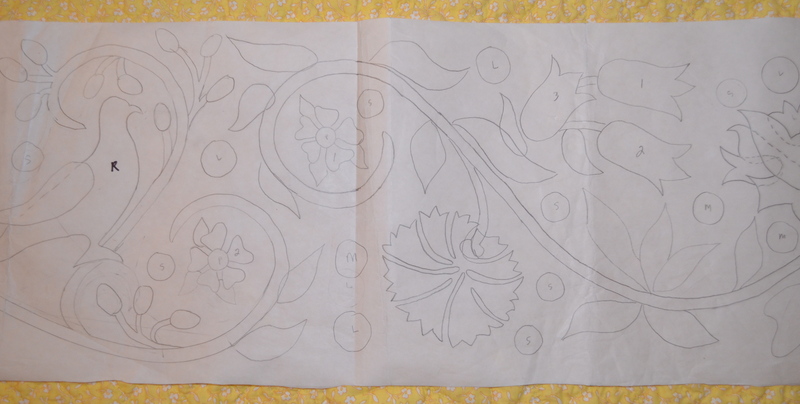 This design will be the corner block, matching up to the long side borders. My DH cut me a piece of plexiglass to fit into the opening where I normally have my sewing machine. [He is such a nice guy!] I put a small florescent light under it to use as a light table. I have a design wall in my sewing room made of thick insulation which is covered with white flannel and screwed to the wall. My four cream colored borders have been pinned to the wall behind where I am working. (They are not pink!…must have been the sunshine!) I divided the border into fourths and marked each border with a water soluble pen. Working from the center out I am placing my pieces onto the border. I can actually use my Clover mini iron to affix my pieces right on the wall before taking it to the ironing board. 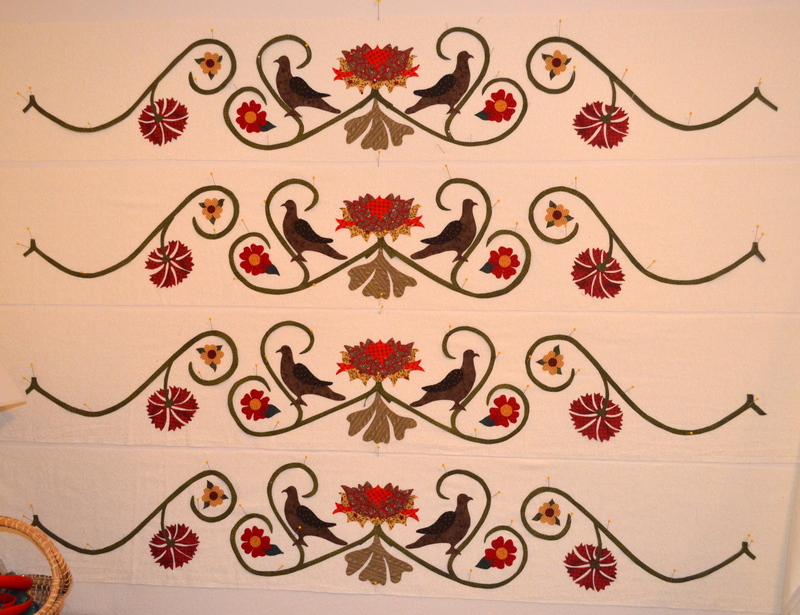 When I have finished the center sections of each border, I will re-pin and do the remaining sections of each border. 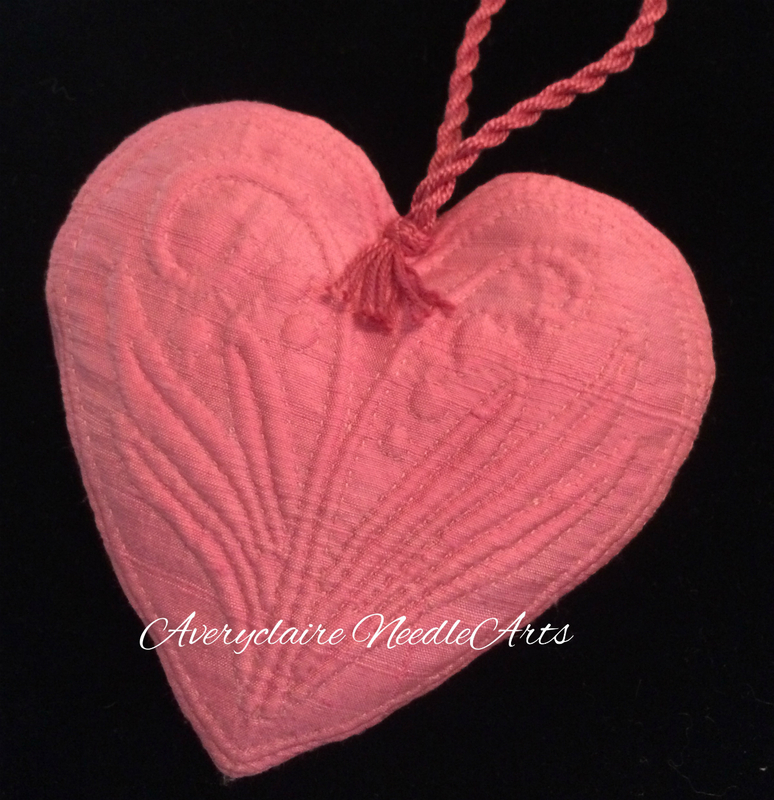 After fusing the borders, I plan to sew my appliques down with a small blanket stitch before sewing the borders onto the quilt. I don’t have any of the leaves or small fabric circles done yet…but I am making good progress with my UFO. 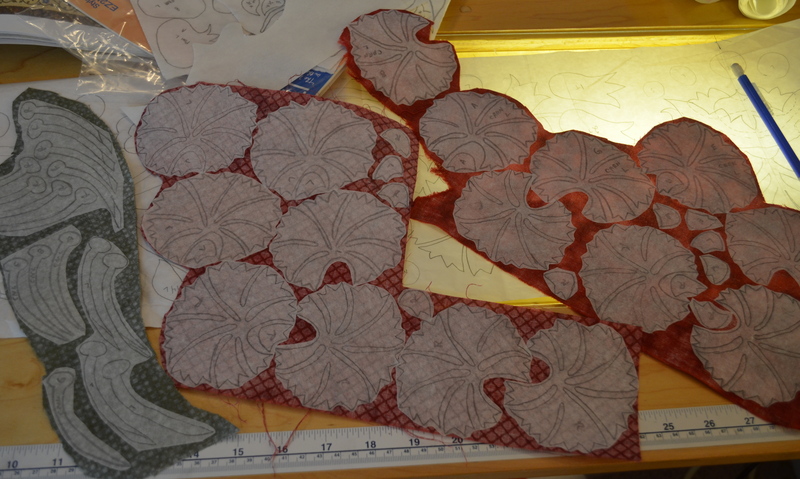 When it is completed, it will be hand quilted. It is a BIG project…. [perhaps I am nuts?!] But the end is in sight for my LONG AWAITED quilt.